Route Work – is it really worth it? The Window Cleaning Magazine speaks with David Morris of Dave Morris Window Cleaning in the South West of the UK and asks the question – is route work really worth it? WCM: How many stores do you clean a month in your business? Dave: I have not really counted but over 1000. WCM: Is the myth correct. Are city centres sewn up by ‘bucket joes’ that have been cleaning the stores since year dot? Dave: Yes and no, we didn’t start cleaning shops until 7 years ago, so i guess that myth is unconfirmed. i guess it depends on the area too. WCM: Whats an average store worth? Dave: A typical small shop around about £4.00 per week and up to a £100 for a department store. WCM: Do you do Nationals with clone stores? Dave: Yes we do, that is what most of the high street is these days. WCM: Do you do the local stores in your home town? Dave: We only clean about 15 in my home town. WCM: Do you have your town sewn up? Dave: No, but we have between about 8 up to 100 in each of the towns in the Southwest, we cover a 240 mile range. WCM: How would one go about getting store work for your window cleaning business? Dave: It is difficult to canvass shop work in some areas as a lot of shops may have had the same guy doing a good, cheap job for the last 10+ years. To get into shops, I would take what’s offered to you initally, do a good job, then hopefully other shops will notice and some will eventually ask you to clean their store too or maybe the National who has asked you to clean one job will give you more work. 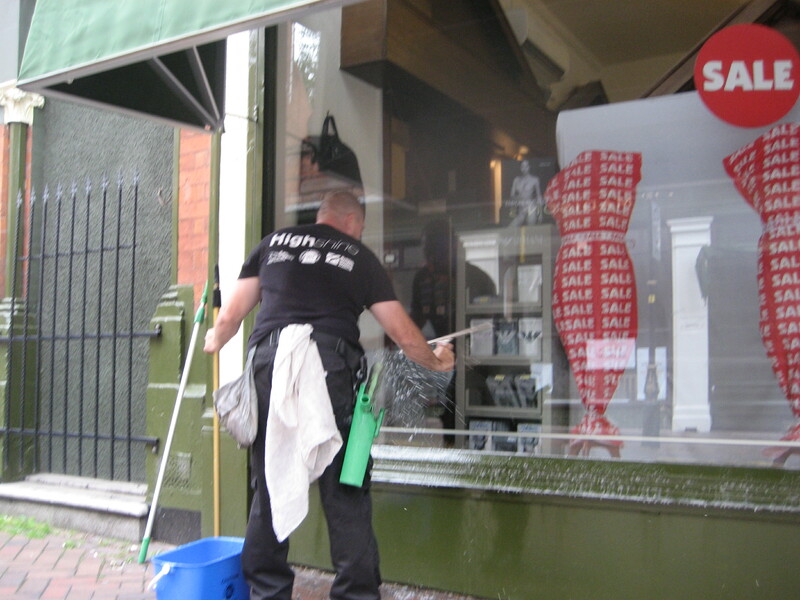 Sometimes you will be cleaning on the high street one morning and see a new shop opening, giving you the perfect chance to ask them if they want a window cleaner. But do bare in my mind, to make a start with shop window cleaning, you might have to do that 15 mile run to clean one shop at £6.00 just to get your foot in the door! The more shops you have the more you will get, It’s a bit like throwing a stone in the pond, which is your first step, the ripples will represent the growth each year. WCM: Is it all early morning work or do you work at night? Dave: We start about 4.30 am, then continue all day. WCM: Give us an example of a days schedule for one of your crews on a route work run. Dave: An example of a typical day would be to set off at 4.00 am for an hours drive to a nearby town. Then we would head straight to a department store to clean all the internal windows and balustrade glass. After this we head off to do any areas where there might be daytime parking issues and to clean any 1st floors that might be due. The next stage is cleaning the shops inside any shopping malls, where we normally would get booted out by about 9.30am. We will then park the van out of the way then continue on the high street carrying out squeegee work until about 12.00. After this we will work the route back home, dropping into the smaller towns where we have less shops. The vans usually start arriving back at the office about 3.00pm, each day is different and we usually have a few larger jobs which we fit in with smaller runs, we have about 5 vans doing this type of work. WCM: What advise would you give for somebody who wants to get route work on their books? Dave: Don’t refuse any of the work you are trying to get into in the first place! I see so many window cleaners refusing to travel or do low value cleans but this is the type of stuff that gets you on to the high street in the first place. The old saying, ‘ you have to be in it to win it’! WCM: How do you make window cleaning national stores pay for themselves? Some stores will be many hours apart in travel time and the actual store might only take 10 minutes to compete the job? Do you loose on some stores? Dave: We never really loose, sometimes something initially might seem not worth it but once you start cleaning you realize you can get through a lot of glass in a short space of time and 9 times out of ten we will be cleaning close to shops we already clean. We always look at the bigger picture and not, to worry if the current hour we are working on is a low one in terms of money earnings. WCM: How many crews service your route work? Dave: Our crews don’t just do route work, we mix it up, so we are doing a bit of everything everyday. We have 8 vans and the guys usually work solo, but we will double up for bigger workloads, or early morning as some towns are just packed out with work which must be done before 9.30 am. Dave: Shop work is hard work and low paying but if you get enough of them in one town, the sum of the collective shops and stores are far greater than each individual store. Let’s face it people don’t want to drive 20 miles to clean a six pound shop, but if you drive 20 miles to clean 40 shops on the high street, then it’s a different matter. Usually, you are not just cleaning shops, there are hotels, industrial units etc, which all add together to make it all worth while.